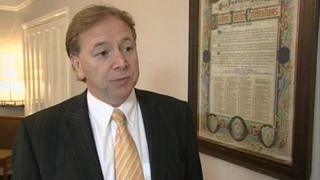 Former Bristol Rovers chairman Geoff Dunford has died at the age of 66, his family has said in a statement. The businessman was involved with the club for 28 years and served as chairman between 2004 and 2007, succeeding his father, Denis. In 2014, he resigned from the Rovers board for personal reasons and a year later was made a Life President. In a statement, the club said: "He will always be remembered for the major role he played in the history of our club." He "quietly and peacefully passed away at home" with his wife and family at his side on Saturday morning. Relatives said he had "very bravely battled a long-term illness" and had "displayed great courage, humour, strength and faith" and would be "greatly missed". The Dunford name has been synonymous with Rovers since the mid-1980s when the family - which owned the Dunford Dairy business - took over the club. Geoff Dunford and his father are credited with saving the club by moving it from Eastville Stadium to a ground share at Bath City's Twerton Park for the 1986-87 season. In an interview with BBC Radio Bristol earlier this year, Geoff Dunford said Rovers had been in a "terrible financial state" and it had taken him "six weeks to decide whether to join the board or not". The highlight of his 10-year stint at the club was Rovers' promotion to the Championship after beating rivals Bristol City in 1990. Passionate about getting Rovers back to Bristol, he also oversaw the club's return to the city - with a move to the Memorial Stadium in 1996. In its statement, the club said "everyone at Bristol Rovers was saddened" by the news. "Geoff and his father, Denis, did so much to keep Rovers going back in 1986 and he will always be remembered for the major role he played in the history of our club." Further tributes have been paid to Mr Dunford, on Twitter.